Features Back to Top ^ Genesis driveline with dynamically balanced five pole skew wound motor and dual flywheels All-wheel drive and electrical pick-up DCC Quick-Plug equipped Detailed fuel tank Wire grab irons Etched metal lift rings Etched metal radiator intake grilles and top radiator screeens Celcon handrails Sand lines, air lines and other seperately applied underframe details Sliding cab windows Etched metal windshield wipers McHenry scale knuckle spring couplers installed Factory installed SoundTraxx Tsunami sound and DCC decoder Tsunami sounds are compatible with both DCC and DC operation Overview Back to Top ^ By the mid-1970’s thousands of first generation locomotives were showing the age after 20 years or so of service. Long since replaced on most Class 1 mainlines by newer more powerful locomotives, old GP7’s and GP9’s had been reassigned to locals, road switchers, and yard jobs. To extend the life of these locomotives without buying new ones, many railroads had begun rebuilding programs. The GP15 series was introduced by EMD in 1976 as an alternative to these rebuilding programs. As originally conceived it was intended that old units be traded in and components such as the trucks reused to make the cost comparable to a rebuilt unit. The GP15-1 was a 1,500 horsepower, 4-axle unit using a non-turbocharged 12-cylinder 645 engine. It differed from the rest of the contemporary geeps by having roof mounted radiators and side intakes like the “tunnel motor” locomotives. There were two major external differences in the GP15-1 production. C&NW and Frisco opted for car body air intakes like a GP7, while Missouri Pacific and Conrail chose a central air intake like the contemporary Dash 2 series. Missouri Pacific’s last order replaced the generator with an alternator. 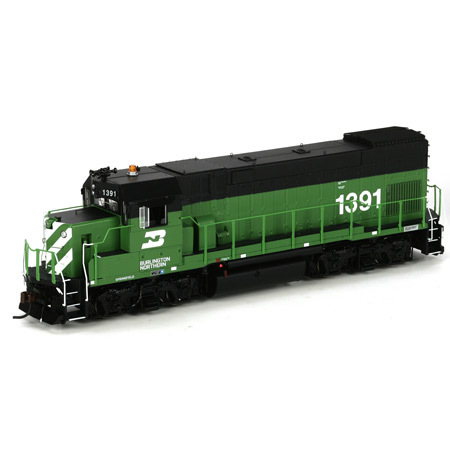 In 1982, Chessie System (C&O) acquired a new model, the GP15T. It was similar to the last GP15-1’s with a central air intake and an alternator, but differed by having a turbocharged 8-cylinder 645 engine and dynamic brakes. Apalachicola Northern also bought GP15T’s, but their three did not have dynamic brakes and had car body air intakes.